One of the biggest problems with electric vehicles is charging them--you know how difficult it is to find a plug when your phone's running out of juice, so you can only imagine how hard it is to find a plug for your car. Qualcomm Halo Wireless Electric Vehicle Charging (WEVC) technology seeks to solve this problem with wireless inductive charging for electric vehicles. Qualcomm Halo WEVC has basically taken inductive charging--which you probably already see in devices such as your electric toothbrush--to the next level, by making it possible to send kilowatts "over an air gap of hundreds of millimeters while still maintaining high-energy transfer electricity." Halo WEVC consists of two parts: a charging plate that attaches to the bottom of the vehicle, and a charging mat that can be placed on or below the ground. Inductive charging uses magnetism to transfer power, and a Qualcomm representative tells PCWorld that Halo WEVC can transfer up to 3.5 kilowatts of power at greater than 90 percent efficiency--that's as good as, or even better, than wired charging. In other words, the car should charge as fast wirelessly as it would if it were wired. The representative also tells PCWorld that the technology is very tolerant, so it's not necessary to park the car precisely over the mat, just "close enough." 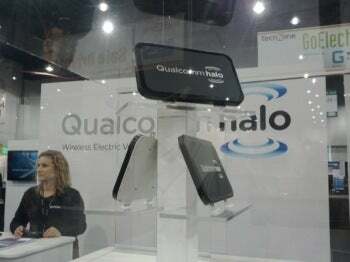 While Halo WEVC is still in prototype mode, Qualcomm has announced that it will launch a trial of the prototype in London. The trial will span two years and involve about 50 cars. If successful, we can expect to see the technology in the consumer market. Qualcomm initially plans to license the technology to automakers, who will integrate the charging plate on the bottom of electric vehicles and include a portable charging mat. Eventually, Qualcomm would like to see the technology in infrastructure (parking lots at offices, supermarkets, etc; street parking), and, ultimately, embedded in highways. The technology supports dynamic charging, which means that the vehicle can be charged while the car is in motion. Such integration, if it ever comes to fruition, will obviously solve the problem of electric vehicle charging altogether.